As temperatures begin to cool, it’s time to take advantage of the weather and appreciate the joy of being outside. Just imagine yourself enjoying the scene in the watercolor above. It features a stucco wall with Chinese tiles as a backdrop for a bountiful flower garden. As you enjoy the bright sun, the smell of the flowers, and the sounds of songbirds, let these sensations warm you as we move toward fall. 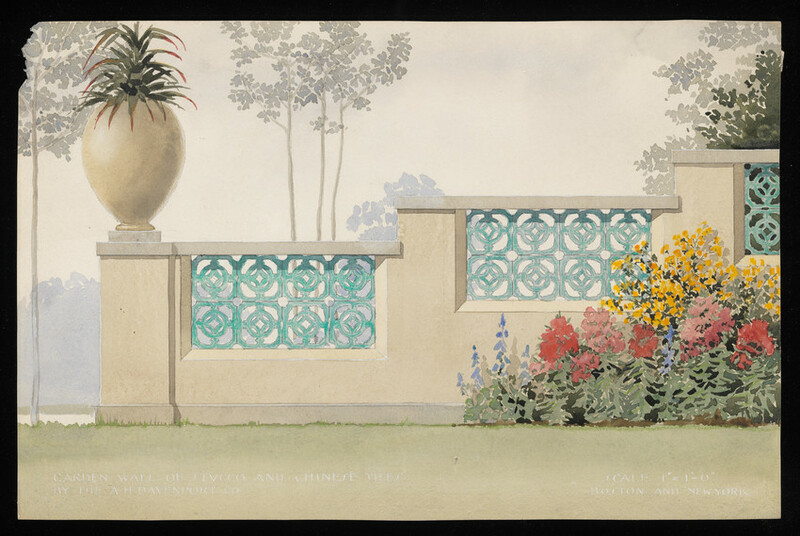 Done in the early twentieth century, this rendering is one of thousands of images in Historic New England’s vast collection of design drawings, photographs, and other material from Irving & Casson – A. H. Davenport Co. It is an example of a little-known aspect of the work of the firm, which is best known as one of finest American manufacturers of interior furnishings from 1880 until the 1970s. Historic New England is working to complete an eighteen-month project of cataloguing and digitizing the Irving & Casson – A. H. Davenport Co. collection. Upon completion in late 2015, you will be able to browse over 8,000 images from the collection in our Collections Access portal. Keep checking our blog for updates on this exciting project. And enjoy the fall!